After launching its motorcycles in the country in January this year, Indian plans to introduce dual colour options including the superb cream-red combination that is sure to be a hit. All the Indian motorcycles are powered by the new 49-degree V-Twin Thunder Stroke 111 engine which makes 138.9Nm of torque at 2,600rpm. It is the largest, most torquey production V-Twin in the market and has head fins, downfiring exhaust and parallel pushrods as reference from the past. A 6-speed manual transmission helps transmit all this power to the road. "Two-tone paint schemes are among the most iconic elements of vintage Indian motorcycles dating back about 80 years, giving the bikes a look and feel that is instantly recognisable and beloved by motorcycle fans," says Steve Menneto, VP of motorcycles for parent company, Polaris. Indian India (we love saying it like that) say we can expect the dual-colour Chiefs to hit our shores around mid-November 2014. New paint schemes on Indian Chief Classic, Chief Vintage and Chieftain mark first of Model Year 2015 announcements MEDINA, Minn. - June 24, 2014 - As a sneak peek to its model year 2015 lineup, Indian Motorcycle®, America's first motorcycle company, today announced two-tone paint schemes, starting at ,799, will be offered for the upcoming model year Indian Chief line of motorcycles available for purchase in fall 2014. The much anticipated, awe-inspiring and iconic vintage paint palettes were on-display over the weekend for fans of classic motorcycles at Vintage Motorcycle Days 2014, which took place at the Mid-Ohio Sports Car Course in Lexington, Ohio. More details and information on all 2015 models, including features and pricing will be announced on August 2. The cool new two-tone Chief Classic, Chief Vintage and Chieftain will also be on-display and ready for demo rides during the upcoming Sturgis Motorcycle Rally, which runs August 2 - 9 in Sturgis, South Dakota. Featured Two-Tone Colors for 2015 are: - The 2015 Indian Chief Classic available in Indian Motorcycle Red and Thunder Black. - The 2015 Indian Chief Vintage available in Indian Motorcycle Red and Thunder Black, Indian Motorcycle Red and Ivory Cream, and Willow Green and Ivory Cream. - The 2015 Indian Chieftain available in Indian Motorcycle Red and Thunder Black, Indian Motorcycle Red and Ivory Cream, and Springfield Blue and Ivory Cream. "Two-tone paint schemes are among the most iconic elements of vintage Indian motorcycles dating back about 80 years, giving the bikes a look and feel that is instantly recognizable and beloved by motorcycle fans," said Steve Menneto, VP of Motorcycles for Polaris Industries. 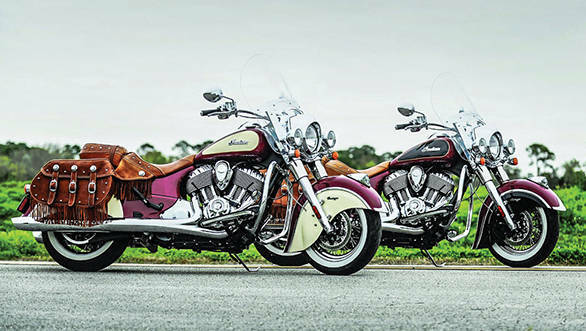 "It is an honor to reintroduce two-tone paint for our 2015 Indian Chief models. These paint schemes pay tribute to Indian bikes of the past but come coupled with the exceptional technology and power that the Chief lineup offers. They are simply stunning, and the quality and craftsmanship of the paint jobs is exceptional. We're excited to share these beautiful bikes and more news with our fans on August 2nd."